Rap-rock is risky business. Aside from the few artists who have managed to defy the odds and successfuly fuse these disparate genres (i.e. Rage Against the Machine), there have been enough terrible examples over the years to discourage the current generation of artists from dabbling in this unholy alchemy. 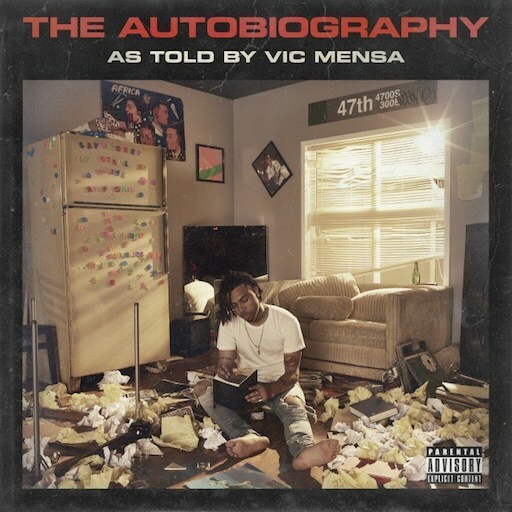 But Vic Mensa’s new album, The Autobiography, is a lyrical, plainspoken hip-hop record that successfully taps into early-2000s alternative as it dissects Mensa’s personal struggles and larger social issues. Mensa, who hails from Chicago, has long used punk aesthetics to make political statements. He showed up to the 2015 VMAs, for instance, in an “Anti-Police”-themed outfit complete punk patches running down his pantlegs and a portrait of famed Black Panther Assata Shakur on his T-shirt. Much like Mensa’s iconic look, punk and other rock subgenres fuel The Autobiography’s outspoken political observations and personal confessions. The album evokes J.Cole as much as does Linkin Park with its combination of dark, guitar-driven production and thoughtful rhymes. “Memories on 47th St.,” for instance, pairs a driving kick drum with dark synths as Mensa reflects on the first time he learned about police brutality firsthand: “At age 12, I learned the difference between white and black/Police pulled me off of my bike, I landed on my back.” The rock influence becomes even more obvious on “Homewrecker” featuring Weezer, whose sorrowful guitar riffs underscore Mensa’s guilt-ridden rhymes about his ex’s reaction when she catches him cheating. Mensa is a skilled storyteller and throughout The Autobiography, he offers anecdotes about his life that make listeners feel as if they really know him. “Say I Didn’t,” for example, opens with a knock from Mensa’s Ghanaian father telling him to come out of the studio because there’s school tomorrow. Later, on the same track, Mensa opens up about a wide range of topics including deaths in his family and his fear of disappointing his parents. He aims to inspire, acknowledging his struggles while celebrating how far he’s come. Mensa also contends with gun violence, a topic that’s often discussed in connection to Chicago. His personal take is a far cry from the sensationalized media narrative: “Heaven On Earth” is written in the form of an emotional letter to a friend who died in a shooting. The theme emerges again on “Down For Some Ignorance (Ghetto Lullaby)” featuring Joey Purp and Chief Keef, a gorgeous, sombre track that meditates on the cycle of violence and trauma. Through Mensa’s forthright confessions, The Autobiography inspires as much as it speaks to our inner angsty adolescents—the ones who used to hole up in their rooms and blast Linkin Park at night. The Autobiography cultivates a similarly intimate listening experience, one that seeks to remind young people especially that they are not alone in their struggles.